No matter how old I get, I’ve never stopped loving funnel cakes from fairs and carnivals. It’s the only “fair food” that I absolutely have to have, and the fact that I brave the heat and crowds (two things I hate) to get them speaks volumes. 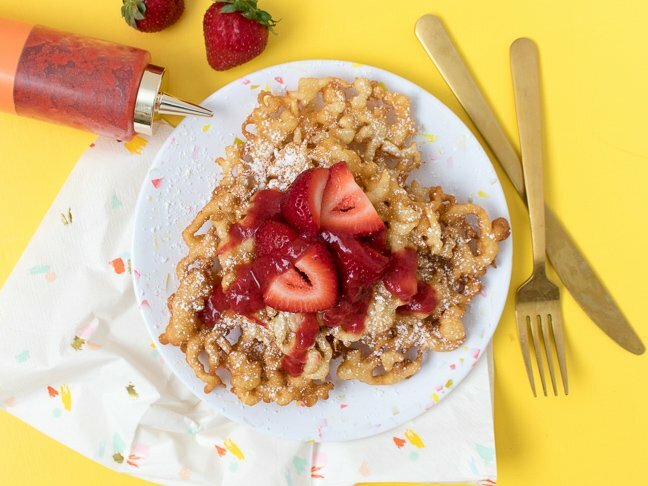 Luckily, I don’t have to endure long lines to order them anymore because I have started making my own funnel cakes at home and customizing them with my favorite toppings. Plus, I can also eat them year round which will definitely test my willpower. 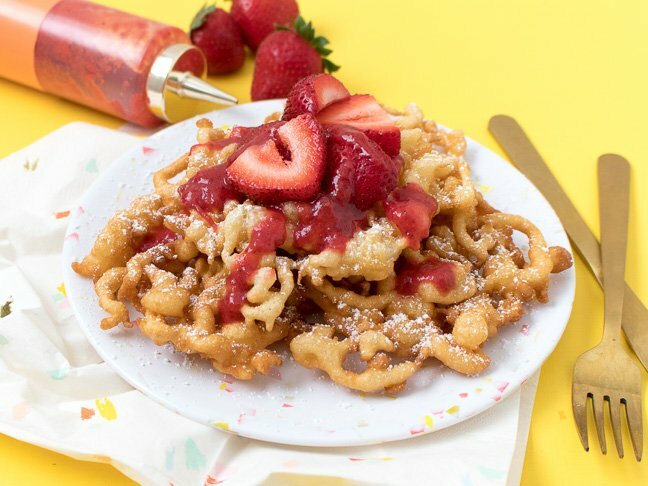 Another upside to making funnel cakes at home is that they are a fun and easy to prepare dessert for barbecues and family gatherings. 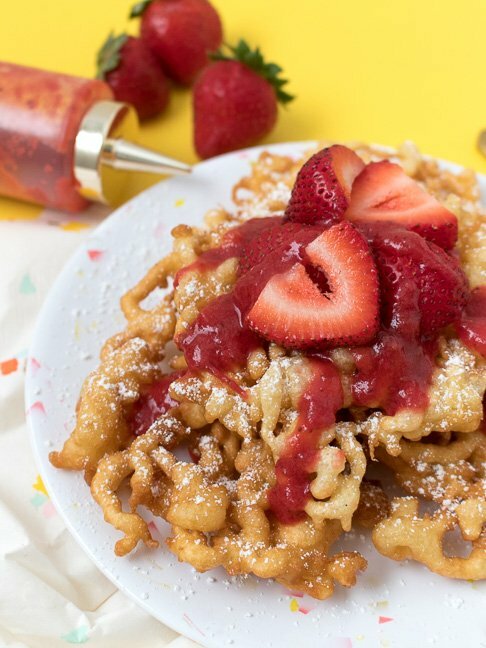 Believe me, the last thing your guests will expect is a piping hot funnel cake for dessert when they come over! Although you can use a squeeze bottle to achieve the classic appearance of these treats, I personally liked the funnel method because my squeeze bottle does not have a wide enough opening. If you decide to use a squeeze bottle, I’d recommend cutting the opening to about 1/4-inch so that enough batter comes out at once. The larger the opening, the wider the funnel cake pattern and the slower it will cook, which also helps keep it from crisping too quickly. The batter for funnel cakes is very similar to pancakes. On its own, the flavor is fine but I think they’re a little plain. 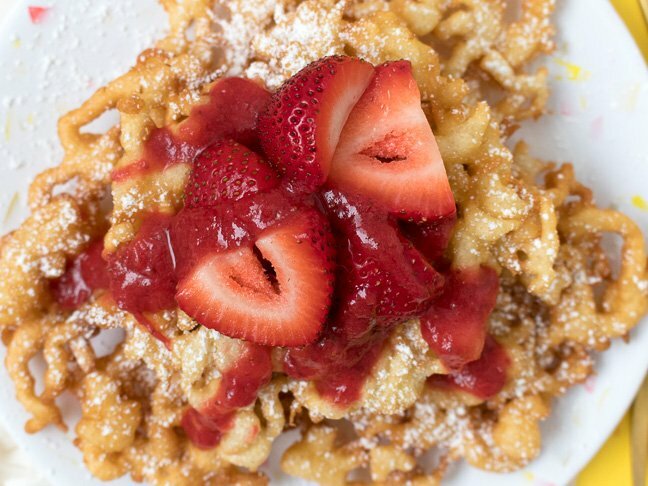 My personal favorite way to serve funnel cakes is topped with powdered sugar and a strawberry sauce with fresh berries. You can also save extra funnel cakes in a ziplock bag for several days after making. Although they are much better fresh, you can bring them back to life in the toaster oven to enjoy them again and again. Step 1: In one bowl, whisk together the flour, baking powder and salt. Step 2: In a separate bowl, whisk together the egg, milk and vanilla. Step 3: Whisk the dry ingredients into the wet ingredients and mix until batter is smooth. Step 4: Move the batter to a squeeze bottle or add a small amount to a funnel with your finger covering the opening. Heat oil in a large 1-in deep skillet over med-high heat. Step 5: When the oil reaches 350 degrees F on a candy thermometer, begin squeezing the batter from the bottle or allowing it to flow from the funnel over the oil in a squiggle pattern so that it all overlaps in a circle. Step 6: Fry until golden, flip and fry for another 1-2 minutes. Remove with a slotted spoon to a paper towel to soak up excess oil. Serve warm. Sprinkle with powdered sugar, fruit, chocolate syrup or other toppings!